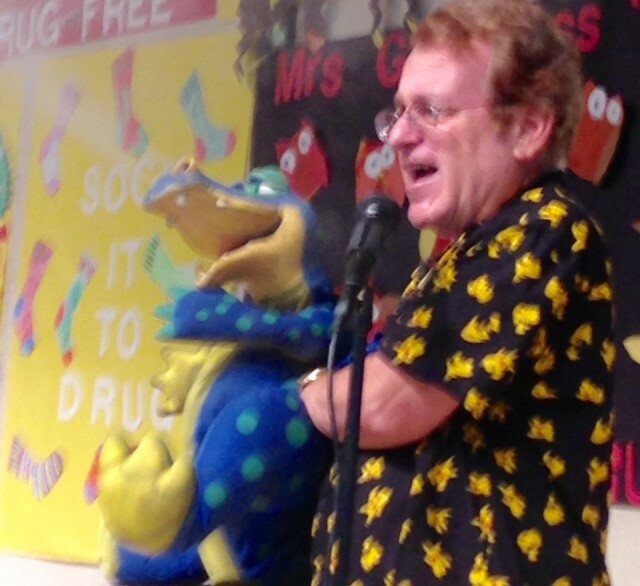 Joe is one of the most popular family entertainers for all types of kids shows. Whether you’re hosting a birthday party, Scout show, Scout Blue and Gold, camp show, library show or just about any other type of young entertainment event, Joe Gandelman & Friends can make it a rousing success. Joe and Bill Arlington, the Zombie entertain at a holiday party. 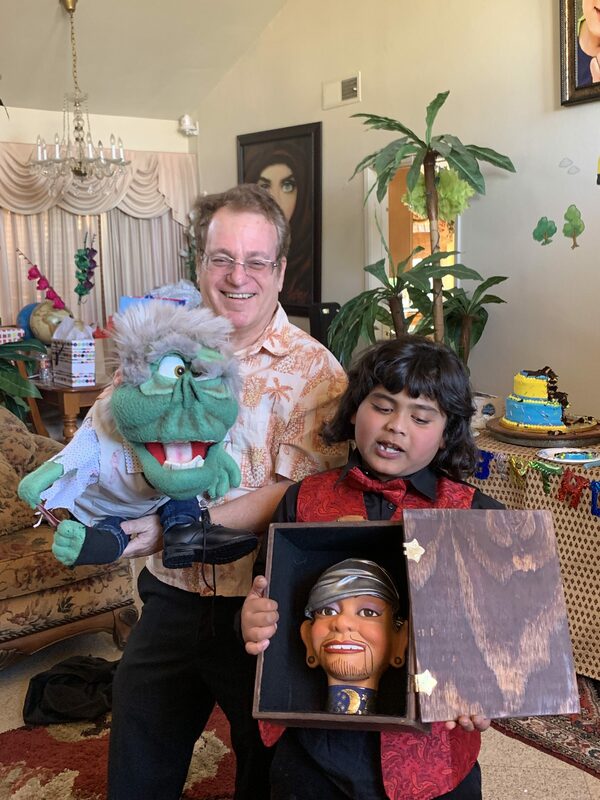 Kids’ birthday parties (done for ALL ages from the tiny to teens) all feature Joe’s BIG cast of characters, laughs throughout the show and interactive bits (including the ventriloquism mask). 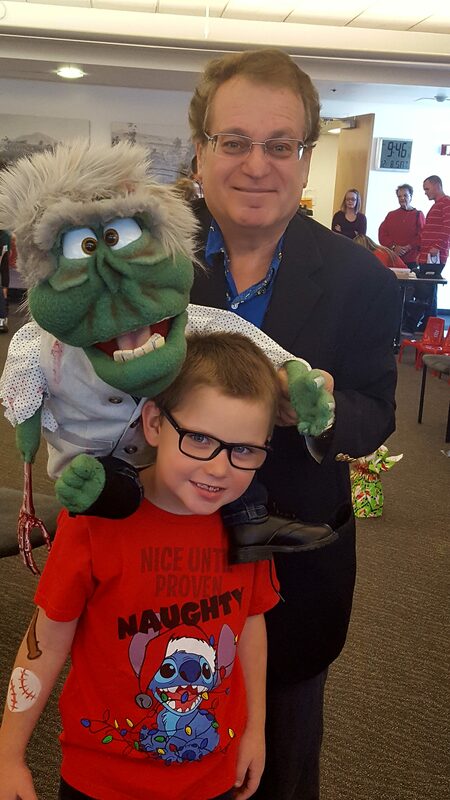 During the show’s final segment kids learn a few ventriloquist and puppetry “secrets” — and some kids even get to become instant ventriloquists! Call today and book Joe for your event! He is a TRUE professional and we would use him again for future parties! He had many puppets and knew what to do to get a reaction to the group! “JOE GANDELMAN IS AMAZING! Joe Gandelman did an amazing job at my daughter’s 10th birthday party! He arrived promptly and his communication before the party was superb. Joe made my daughter feel special throughout his performance by giving her the first opportunity to answer questions/volunteer. He also included the other children at the party and allowed them to volunteer and participate. The adults at the party were also thoroughly entertained also and impressed with his talent. His ventriloquism is top notch! He had a variety of high quality puppets that kept us on our toes to see what was coming next! Audience participation is a part of what Joe and his BIG cast of characters bring to the party. Joe did not rush through our party one bit; in fact, Joe offered every child an opportunity to meet/ interact and try a puppet at the end of the show. Joe also spent a good amount of time talking with adults who had questions about what type of puppet to purchase and where. A young audience member helps Joe demonstrate the talking lips.